Social innovation and academia: how do we bridge the gap? The Social Innovation Community’s Academic-Led Innovation network deals with the topic of ‘bridging’ social innovation and academia by exploring the multiple roles of, and relations between, academia and social innovation, and their potential to have transformative societal and scientific impact. 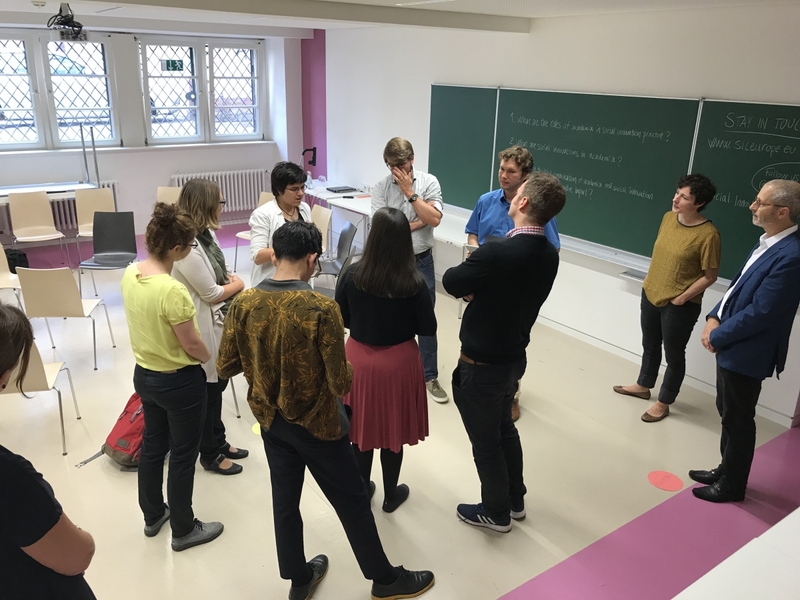 Recently the Academic Led Innovation Network had the chance to bring together a diverse group of actors in workshops at two large venues in Europe. Participants were individuals and organisations who either work inside academia, or are engaging with academia. The workshops explored research and academia through the lens of social innovation. This means that we started from the assumption that alternative modes of research and education that are at the heart of the notion of bridging knowledge (partnerships, action-based research, open education based on real-challenges etc. ), are social innovations themselves. And in that sense, we are already seeing social innovation in the changes and adaptations happening in academia. We assume that academia doesn’t have one fixed, but multiple, overlapping, fluid and negotiable roles in the practice of social innovation. The purpose of the two workshops (one held at the Living Knowledge conference in May 2018 and one at the International Social Innovation Research Conference in September 2018) was to explore how these assumptions came out in the stories and realities shared by the participants. We wanted to map existing practice and to understand where the barriers and challenges are. At the Living Knowledge conference held in Budapest, we started from the perspective that the alternative modes of research that are at the heart of the Living Knowledge Network (such as science shops, participatory action research, transdisciplinary research or citizen science) are social innovations themselves. Coming from an outside perspective, these different strategies and changes are more social in their character, more inclusive and more impactful beyond the boundaries of academia and academic institutions. At the ISIRC conference held in Heidelberg, we facilitated interaction between stakeholders with an interest in the social innovation operating from within, and externally with, academia. Sitting in a big circle, we asked amongst others a think tank, a social impact oriented foundation, a researcher and a cross-sector education developer how there might be ways to better bridge academia and practice. We asked them to dare each other with honest reflections and requests, which spoke to the point of bridging and taking the benefits of academia into the broader field of social innovation. In Budapest, participants were asked to write down the research approaches they have been working with lately, and with these post-its to map themselves in a square system indicating the level of criticality and relationality their examples build on. Criticality referred to how much the example questions existing practice (how new and different was it) and relationality asked to what extent the example engages with or involves others (new forms of collaboration/alignment). Several participants placed their examples in the domain of highly critically and highly relational. 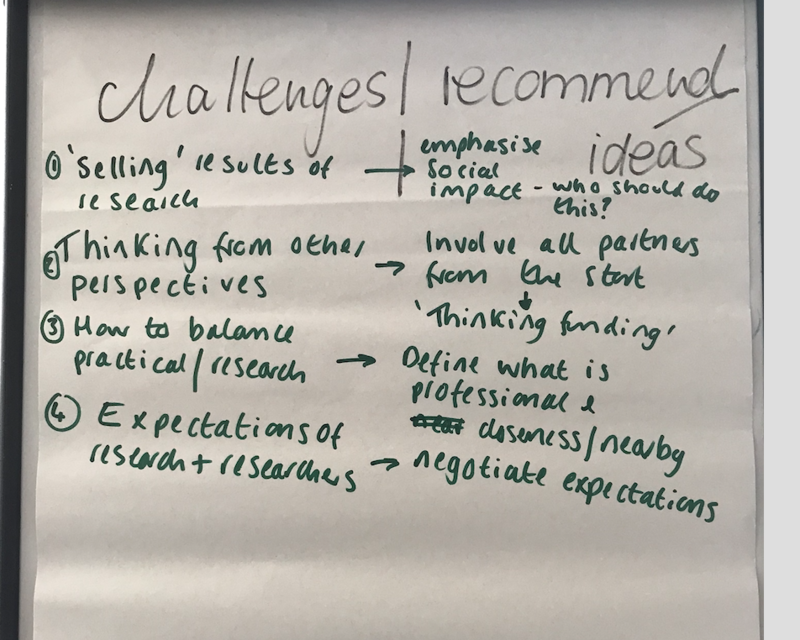 Based on the examples, we explored with the participants how their change of practice gave them a new role as researcher or teacher, or how the change of practice makes a space for outside individual or organisational influencers to work with academia. One of the main benefits described by participants was the ability to work more purposefully and usefully with practice. We also learned that there exists a number of misconceived realities. One case came from a foundation who wants to better support research’s engagement in practice. They shared how they often are challenged by not knowing how to get in touch or how to align with research.The sector silos maintain the gap in understanding each other’s realities, creating less openness and less awareness. When we are actually seeing a change of interest and behaviour – e.g. not just funding each other, but working closely together through our challenges – it can be hard to believe. By exploring the changing practice happening in the dialogues we had, it was easy to see how a new field of collaboration can be established, new entrance points explored and a new way of dialogue brought to life. But leveraging this to a systemic practice with a widespread effect still opens the questions of; who owns the responsibility of ensuring we tap into and benefit from mindset change? Where should the system change begin? And are the actors involved aware that they need to support it? What are the roles of academia in social innovation practice? What are social innovations in academia? What are new ways of framing, doing, organising and knowing that are taking hold? How can a fruitful combination of academia and social innovation practice lead to transformative impact? We asked them to be very honest, and to share their frustrations within the neutrality and safety of the workshops. The dialogue revealed hopes and beliefs, but also challenges regarding where the ‘bridge’ isn’t operating as it could. With participants, we took the opportunity to identify ideas for ways to overcome some of these. Here are four of the challenges we saw, and the ideas we had for how to overcome them. Action → Emphasise the social impact and have the honest conversation about who should do this! Often, the insights gathered through research are not used in the real world and we miss out on the positive effect this research and knowledge could have on society. We agreed that changing this starts with a shared commitment to wanting to achieve real social impact from research. This needs to come from a common belief that this is the core purpose of one’s work, and so must be prioritised in the measurement of our work and impact. Having that set, players must have an honest conversation about how this impact is achieved. Both in a wide sense of questioning what impact is, and on a practical day-to-day level. Should researchers call practitioners for a check-in everytime a new research begins, or at the end of a research project ask practitioners for tips on how to become impactful? Can practice connect to researchers more often to ‘lobby’ them in impactful and useful directions? And in doing so, will research stay committed to its ethical purpose? Action → Involve all actors from the start. ‘Thinking funding’ should also be about involvement and not just a checklist practice. When we come together in dialogue (for example, at conferences), we share our own realities and accept others. We find alignment in the dialogue, but how good are we at actually bringing this mindset back into everyday practice? How often do we remember to place ourselves in others shoes before we just head off with our own agenda? Breaking down silos first and foremost takes the form of thinking from others’ perspectives to ensure that we achieve the impact we need and want. A practice like this relies more on curiosity, and prevents us from making assumptions about how we think others would like to be included or involved -for example, including foundations in projects and programmes as more than the providers of money. Action → Connect more closely with professions and themes. Define how balance is formed within different professions, how to avoid being met with closed doors and instead orchestrate approaches that create ownership and help build relationships. Practice and research operates with a very different perception of time and place. Practice often need research inputs to happen quickly, and research environments operate at a slower pace, adapting to teaching, publication, review processes and so on. Finding common ground and common rhythms therefore can be a challenge. However, there are ways to overcome this issue, which sits at the core of the problem of why we are not more collaborative. Identifying what works within a specific profession and identifying what works within a specific ‘theme’ can be a good starting point. When the change is closer linked to themes and professions, it will be easier to convince those at the top, who must be supportive to ensure long term change. Another way of reducing complexity is to trial the collaboration in more local settings, creating more shared references and an increase in the feeling of ownership. Action → negotiate expectations. This is a shared response! We are still in the early days of learning and trying out this experimentation. But we need an experimental mindset and to focus on trying this out in more places and in a more ongoing way. Participants shared how this is not always well supported inside academia, and that it can be tough to negotiate new terms and expectations as you are speaking against or outside protocol, asking for people to give more than what they are credited for in their own system. The REF framework in the UK is a way of starting to build more legitimate structures that focus to a higher degree on societal impact. Rethinking the purposes of academia must be explored by everyone, but has to be held by academia itself. There are organisations like SIX, who are working closely with universities worldwide to help them rethink their purpose. We need more stories about systems change and more stories on the changes currently taking place within the sector. Changing the narrative can help people identify themselves differently, it can help improve motivation and help foster new energy. We learned that telling the stories and actually listening is not happening regularly enough. We are losing the potential of what storytelling allows us. But not only do we need to share the ideas, aim and results, we also need to find the time and format to do so. This is one of the essential purposes of the Academic Led Innovation network. This is a first step in trying to tell a different story about what is going on in the conversations and interactions with innovators in academia. Please get in touch to tell us about how you are transforming academia, or what you think should happen for a more social innovation-led academic world.